****Don't forget to enter the $40 Right on the Walls Giveaway that ends TONIGHT at MIDNIGHT! 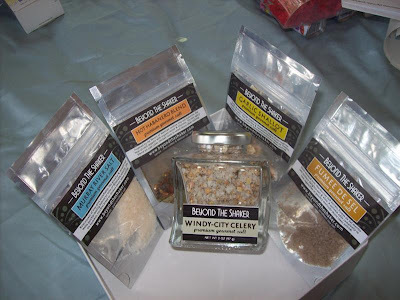 Beyond the Shaker sent me some of their gourmet salt for review. My favorite part about this company is that they are from Michigan like me! The salts are also unrefined. I got to try some awesome blends including windy city celery, hot habanero, and garlic shallot salts. I will be honest and say that I do not use salt a lot in my own food but on a Chicago hot dog, the windy city celery would be great! Also, last night I had a salad with balsamic vinegar on it and added a little garlic shallot salt and it was so tasty! 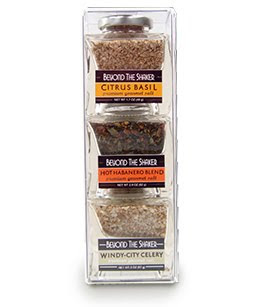 These salts come in very cute packages and would be great to give as gifts or for yourself. Giveaway: Beyond the Shaker will be giving away one of their Top Sellers Set (pictured below) to one lucky reader (A $29 value)! The contest is open until midnight Thursday August 19th. The winner will be chosen on Friday August 20th via Random.org. Mandatory: Visit the Beyond the Shaker website and let me know what kind of salt that you want to try the most. I would like to try the French Herb the most. I think I would want to try the Garden Herb flavor...although some of those pretty colored ones look really awesome! I found your site through Fitnessista! I am a subscriber to your blog via google reader! i found you through one of the blog hops i think and subscribed then! I found your blog through a link from another blog ! Hi! Following you back from FMBT! Thanks for visiting. I love daschunds too! Following you back. Thanks for checking my blog out. I found your blog from Follow Me Friday. You found me and I came by to follow back and thought I would read a little bit more! I entered Mangroomer Body Shaver giveaway. I want the hot habenaro blend! Thanks for following. I am following back! Hi Amanda! I am following you back via FMBT! What a wealth of information! I love the veggie soup recipe! Sounds like something I will have to try! Thank you for sharing! Thank you for stopping by and following my blog at www.texasmonkey.blogspot.com I'm now following you back and I'm so glad to have found your blog. Please stop back by anytime. I love getting to know fellow bloggers. Amanda, as they ship to Canada I am assuming we are included LOL, I would love to try this one:Hot Habanero Blend I love hot and this would be very hot I think. These all sound great though. I would like to try the Bolivian Rose Salt! I found your blog on Follow Me Friday! I am entered in the chocolate giveaway! I am entered in the coffee giveaway! I follow your blog and you found me by posting a comment on my blog! Thanks! I follow you on GFC as wendy wallach and I came to say hi because you left a note on my blog, " It's Really Only a Purple World". I'd love the hot habenero blend. The Murray River Salt sounds very nice. I subscribed and confirmed by email. I subsribe to your feed by google reader. I found you by Anderson House of Chaos on their posting for today. I entered your •Sweetriot Cacao Nibs giveaway. Entered your •Cafe Don Pablo Coffee-giveaway. definitely the Windy City Celery would be my first choice. I think it would be great on pizza! !